ACET follows the Comprehensive approach to Health Education as recommended by the World Health Organisation and endorsed by the Public Health Agency in Northern Ireland. 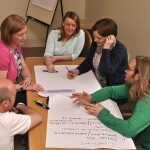 All Programmes involve multiple sessions with each service using group, using interactive learning. All ACET Programmes have been accredited and have SMART objectives, defined learning outcomes and assessment criteria to measure effectiveness, providing solid evidence of the participants learning experience. All Programmes are evaluated and ACET produces detailed Evaluation Reports based on feedback from the service users. All ACET Trainers have been trained and hold professional qualifications as community educators. ACET is an Open College Network Approved Centre for writing, producing, delivering and evaluating Community Education Programmes and Training Courses, our services are unique and not available from other sources. ACET participates in Information Exchange Forums and Community of Interest Forums comprising both Statutory and Voluntary Sector agencies helping facilitate community partnership initiatives, to share experience and to be a voice for our service users. This includes the Public Health Agency, and all five Health & Social Care Trusts in Northern Ireland.